In Japan I often get asked the question: what is the staple food of Ireland. Potato is the short answer, but that one word answer will never suffice in a country where potato is not considered a staple food. If I answer "potato" the questioner assumes I did not understand the question and offers "rice" or "bread" as sample answers. So I have learned over the years to preempt the misunderstanding and give a longer detailed explanation. Essentially, potato is to the Irish what rice is to the Japanese. We have potato with nearly every meal. We even have desserts with potato in them. Traditionally we don't eat bread or rice with our meals. Just potato. And it is as important to us as rice is to the Japanese. Despite growing up in potato country, with potatoes not only part of our diet, but part of our history, I had never picked a potato until I came to Japan. And I have learned much more about potatoes here in Japan, than I ever did in Ireland. I live in a rural part of Japan in a farming community. I don't farm, but all around me there are farming families who have lived on and worked this land for thousands of years. Without much effort, or indeed hands on experience, I have learned a little about farming in my ten years in town. My young children have grown up with many opportunities to grow and harvest vegetables, particularly by some uncanny twist of fate, potatoes. In June and early July potato harvesting is a common and popular event in the kanto area of Japan. Kids do it in the neighborhood, in some cases in municipal potato fields, in our case community fields. Fields that are lent for free to the community by a community of land rich farmers. My kids and thousands like them have been planting and harvesting potatoes in the community fields since they were old enough to walk. And it is not just in the neighborhood fields, my kids and I have numerous opportunities to pick potatoes at this time of year, and usually for free. A couple of months after entering preschool they harvest the preschool potatoes that the older grades have planted. In subsequent years they both plant and pick. My younger children pick potatoes in kindergarten, my older children in elementary school. 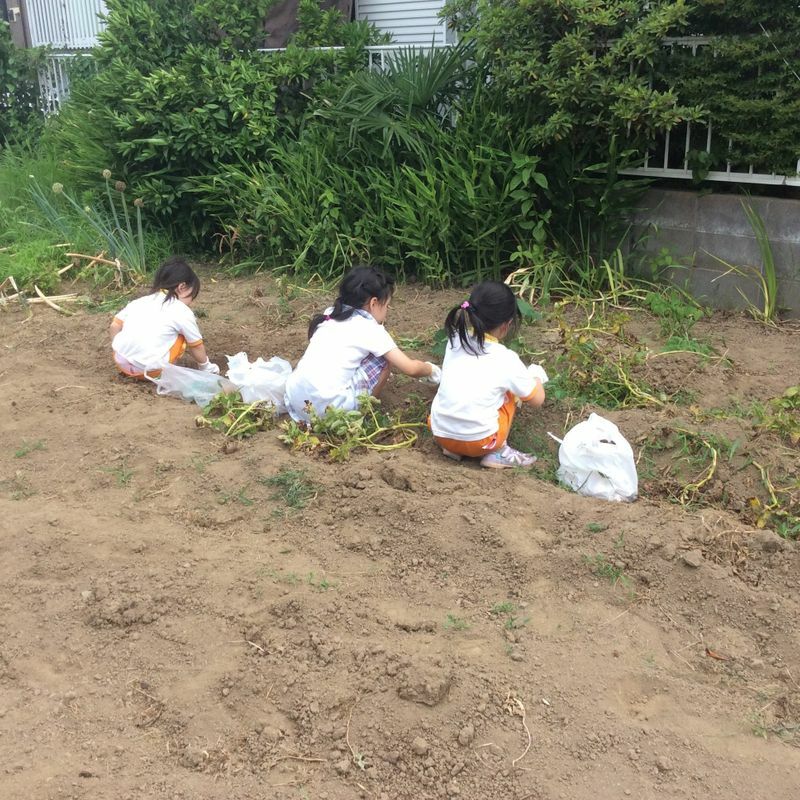 Some schools even have excursions to potato picking fields in neighboring towns or cities. In our town there is local potato festival in June, where we pick and eat potatoes for free. This year we even tried our at hand at growing our own in our vegetable patch. They are quite easy and quick to grow in the Kanto area of Japan thanks to the weather. Yesterday we fervently picked the last of our potatoes, before today's heavy rains could ruin them. We got an excellent crop this year. The kids thoroughly enjoy summer harvesting and love living in potato picking heaven!